A Slab of Pork Chop @ Scotch Restaurant & Pub – A tender cut commonly used in Chinese cooking, marinated then pan-fried in a simple manner. Words can’t express how much I would love to divulge the history/legacy behind Scotch Pub, a classic Western diner that has been around for ages in Ipoh Garden South. 20 years? Or maybe more? I can’t be sure, but this perennial classic had been battling out with the newer, funkier generations and yet still standing strong. The legendary FMS in Ipoh’s old town was closed back in late 2007, for renovations that lasted to this very day. Miner’s Arms (also in old town) on the other hand, was shut down for business sometime last year, though the charming, once the MOST prestigious Western diner in town was not doing so well in the past few years. First Coffee House on Cockman Street (Jalan Dato Onn Jaafar) recently underwent a major facelift, sporting a lime green exterior but I have not visited the cafe since my secondary school days. Rendezvous Cafe at the corner of Cockman Street and Brewster Road (Jalan Sultan Idris Shah) ceased operations few years ago, giving way to some dodgy cafe … followed suit by Blue Window Cafe located further down the road. Do you think that Scotch Pub is in serious threat of losing out to the freshly-conceptualized fusion cafes, fine diners, and bistros? Or can they beat the odds; maybe creating history as THE longest running coffee house in Ipoh? Read on to find out ….. Walking in into Scotch Pub brought back memories from the days of yore. Maybe not so much for the teenagers of today, but definitely something special for the 80’s babies, or prior to that. Miner’s Arms was deemed to be THE Indulgence back when I was a kid. A feast at the former was usually met with rounds of applause and gleeful cheer, a once in a blue moon celebratory outing. And so we resorted to the slightly more affordable lunch sets at Rendezvous, First or Scotch Pub. Surprise, surprise! Scotch Pub is STILL offering value for money sets (RM11.50/USD3.50) on a daily basis (not sure about weekends though, anyone?). The mains are rotated from day to day, hence you won’t get the same lamb chop set if you’re visiting on different days of the week. A set comes with a soup of the day (it was a tangy, mixed vegetable soup in a tomato base, almost like a Borsch), butter and roll, a choice of tea or coffee, and a slice of fresh fruit. But if you’re not keen on the full set, you can always order the other items on the menu, and for an additional RM1/USD0.30, you can opt to upgrade the main dish into a set with the same complementary items. I set my eyes on the pork chop almost instantaneously. 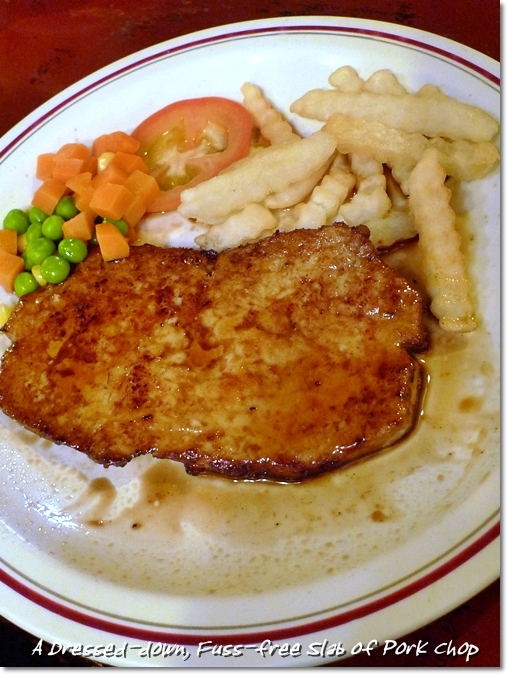 Seldom can one find a good, traditional, no-frills pork chop in Western diners these days. I just knew that Scotch Pub would not screw the simple dish with excessive ‘flower power’ and fusion madness. True to its theme of staying to its most original roots, the lamb, pork and chicken were exactly how they were done back in the days. Nothing fancy, and nothing ground-breaking. Just down-to-earth Western cuisine with a beautifully nostalgic Hainanese (Midas?) touch. Wait, I can’t even be sure if the restaurant is operated by Hainanese now …… Pardon my ignorance. 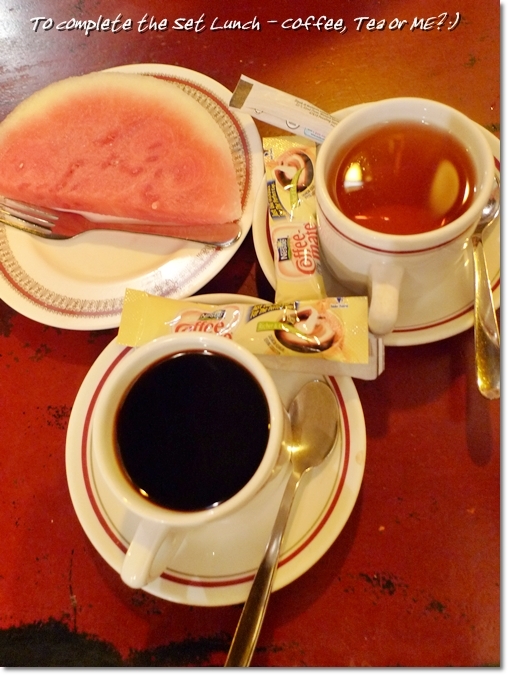 And to complete your set lunch – The coffee/tea plus a slice of watermelon. Truthfully, Scotch Pub has never been one of my family’s favourite coffee house. We preferred Rendezvous Cafe back in the 90’s, for we felt that Scotch served rather measly portions in comparison. Fast forward 20 years or so; and Scotch’s portions are deemed reasonably generous – given the easy on the eyes prices. After all, not many outlets can boast of serving lunch sets for less than RM15 each, and still manage to attract a familiar crowd on a daily basis for the quality of their food. Scotch Pub also serves Asian cuisine like fried noodles, fried rice, inchi kabin chicken (a Nyonya style of crispy fried chicken), and many more. Thum’s Western Food – This photo did not do justice to the immensely humongous portion of Chicken Maryland placed on our table !!! On a completely different scale (more or less), Thum’s Western Food – a kiosk parked within New Weng Fatt Cafe & Restaurant in Ipoh Garden South still serves up some mean, huge portions of Western fares to the dinner crowd. Don’t rule this out just yet. 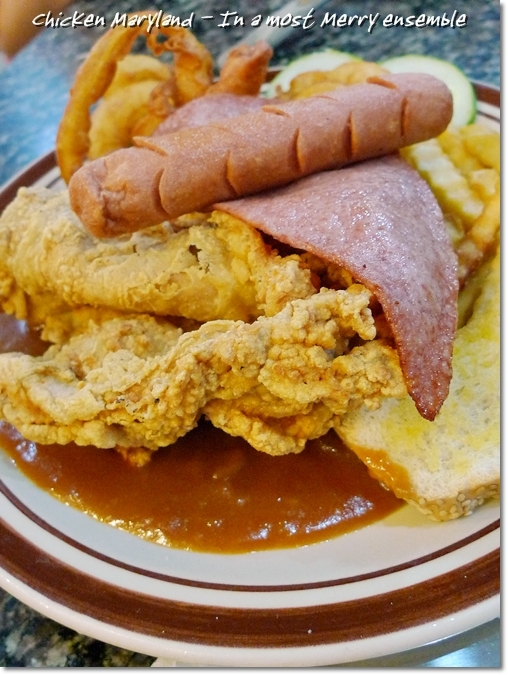 The sumptuous onion gravy is their killer creation, paired so marvelously with ANY of their mains, or even sides. I wrote about them TWICE back in 2008 (Read HERE and HERE for the full stories). You may think this was just another one of those Western cuisine maestro wannabe, starting out from a pathetic stall in a coffee shop. But you are SO WRONG. 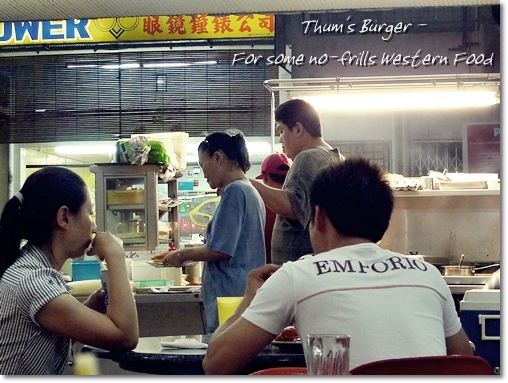 For years now, Thum’s Western Food has been a favourite with the local folks, a closely-guarded secret even. 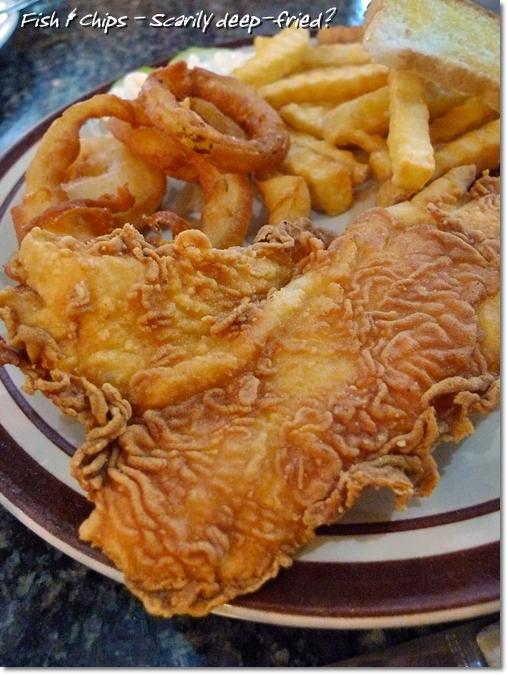 Although not everything’s splendid (some like the Fish & Chips are deep-fried until way too crispy; sometimes a little dry from the loss of moisture), you can’t go wrong with the pork chop, bacon sandwich, and onion rings. LOTS and LOTS of onion rings. Unlike the conventional frozen ones (Burger King‘s come to mind, naturally) with nary a touch of personalization, Thum’s version of the crispy snacks is top notch. You can really taste the sweet onions coated within the crunchy batter. And they serve onion rings AND fries together with the main of your choice. The Bacon Sandwich, Chicken Burger, and platter of Fried Mussels with Onion Rings are safe choices in case you’re seeking for a ‘lighter’ meal. Everything’s priced reasonably, with most items priced around RM9-RM15 (USD2.70-USD4.50) each. You have to bear the wait on packed days. They may be well-staffed but not as efficient in terms of service. Oh, you have to walk over and make your orders, obviously. There is a fried rice/noodles stall, another pan mee stall, and the rather famous capati/Indian curry rice stall in case anyone in your group is not fond of Western cuisine. The purpose I included Thum’s Western Food together in this Scotch Pub post is because these two outlets are situated rather close to one another in Ipoh Garden South, and the fact that both of them are considered comfort (Western) food that I used to grow up with. SO, WHERE’S YOUR FAVOURITE CLASSIC WESTERN DINER? 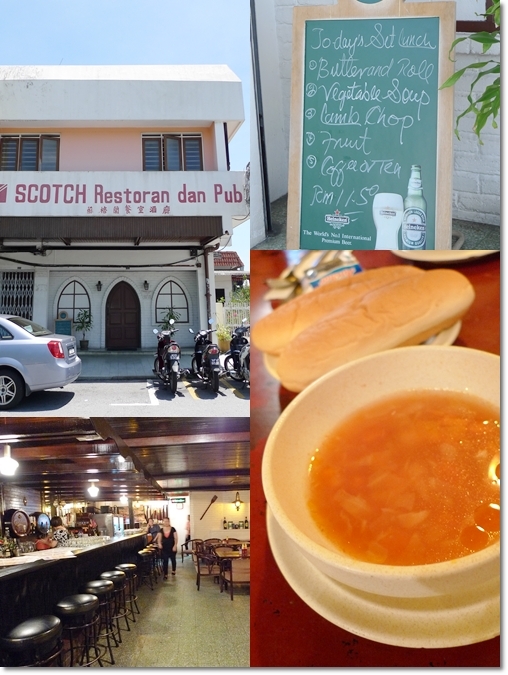 Here’s GOOGLE MAP to Scotch Pub & Thum’s Western Food in Ipoh Garden South. Yup, according to my brother who works nearby. But I myself have not been there for some time now. The food taste so so only… service not satisfaction and the tips was necessary! Tips necessary?! What do you mean, Nicole? Food is so-so, yes. I do agree on this. They will provide some wet tissue like chinese restaurant which cost aroubd 60 cents or 1 dollar. As i not using it, and would like to request deduct it from my bill. But, they told us that was their tips and cannot deduct. How come like this, better charge for service tax lo…. Scotch Restaurant & Pub had been around for more than 25 years and their service are legendary! Sometime, they will snub you….. “drop” cutlery on your table…. they, make you invincible…. but hey!!…. that’s Scotch Restaurant! That’s their culture all these years!! Speak to them the same way their speak to you!! LOL! Best time to visit… during a hot day afternoon, have a mug of chilling beer !!! and do try their Steam Chicken Drumstick!!! It’s Good! Service legendary?! Haha … I gotta go more often to see this myself. I am eyeing their fried meehoon and inchi kabin. Gotta be good with all the recommendations. As notorious as they may be for the service, this place holds promise for staying to its old school root. The environment looks quite simple to me.. I guess it’s comfortable inside 😀 Food so-so only? But they look very nice and tasty wor..
Wow.. i almost forgot about this 2 places..
Yeah ….. nowadays, I see even some of the young children asking what’s the big deal about a piece of fried chicken, a ham, a sausage and a batter-fried banana?!! Yeah, but the idea of eating everything that’s been deep-fried is kinda scary though. But once in a while that’s fine. This is the kind of food that I was raised on. I am trying to learn all of the recipes so, I can keep enjoying the food that I love. Ooh just opposite my house! The Scotch one looks nais! Staying in Ipoh Garden South? Haha … that’s good. Easy access to many eateries there. Looks like this wonderful nostalgic Scotch Pub will closed down soon just like Miners Arms. Rumors has it that the current owner is selling its business as there is none family members interested to run the restaurant. Oh dang … and I thought that Scotch Pub will somehow achieve a miracle by staying as long as the previous FMS, sans renovations. Kinda pity really, for a legacy would be lost just like that ….. because of no interest from the younger generations. Wow, all these names bring back old memories – First, Rendezvous, Miner’s Arm, FMS, & Scotch of course……..but during secondary school days, we went to First & Rendezvous most coz accessible by bus after school. While Scotch is tuck away at another side of the city. Rendezvous was also more spacious comparing with Scotch…………But First offerred the most economical set lunch, though the interior was really so so then. Gosh…….time flies, those were the happy days:) Sad to learn that the only one left standing nostalgic “coffee house” – Scotch also closing down soon:( Hopefully it’s just rumour……. Yeah, let’s hope that’s a rumour. First is still standing, and had been renovated recently. Though I don’t really like the food there. Back then I really, really liked Rendezvous, for the comfortable environment and great sets. Ahhh! I think I can take a guess of which generation you’re from hahaha! Grew up with all those names too …. First Coffee Hse was almost a weekly Sunday treat & Rendezvous was a hot favourite with for coffee and live music on Sat nites…Still remember their Irish coffee, it was only one of the very few places with great food AND decent live music on weekends back then..
Oh, yeah … I read before from Alexandra’s post in The Star, whereby she was brought to the club by the owner of Canning Garden roast duck stall owner; a feisty lady herself. It’s been ages since I visited the Club, I think close to 15 years now! Ah, Scotch. Only been there twice; on 1st time, we had a really bad service, where the waitress pour the coins onto our table when my friend tried to pick the change! 2nd time was ok but nothing excellent…. they really need to do more in case they wanna keep surviving. Service really so deplorable? Haha, maybe they expected you to give tips instead? But I’ll be frustrated if they do that to me too. Jason, you are unfortunately served by the only below par waitress at Scotch. I’m a regular and I sort of know who and who. Don’t leave a cent of tip if it is not deserving. On the other hand, on a lucky day, when fish is fresh at the market, fish & chips is highly recommmended, it’s on the menu but not available on a daily basis. I have also seen diner having steamed chicken thigh with steamed rice. It looks really appetising. The ginger & spring onion beef is delicious too, if you fancy beef. That afternoon we went was okay, considering that the staff were all accommodating and no attitudes. Speaking of nostalgia Motormouth, have you ever tried Pete’s Western Grill in the 90’s? It was located on Jalan Dato Onn Jaafar. Let’s say you were heading towards Super Kinta from Olympia College/Bersatu, the place was on your left, opposite 1Stop, and just a little past Yohan bakery. It was run by a nice couple who could grill the heck out of anything. And near Xmas every year they’d take orders for roast turkey, complete with stuffing and cranberry sauce. Alas last I heard they moved to Malacca in the late 90’s, and I think now the restaurant is a furniture shop. I really thought that place was as good as Thum’s. One more… have you tried the western food at YMCA Ipoh as a high school kid? The portions were enormous! I think the chef retired in the late 90’s as well. They had really good food. Fond memories, thanks for a good post dude. Uh oh… beats me Dr Lau !!! This may be too ancient to register on my memory. I gotta ask my parents on this one. And YES! 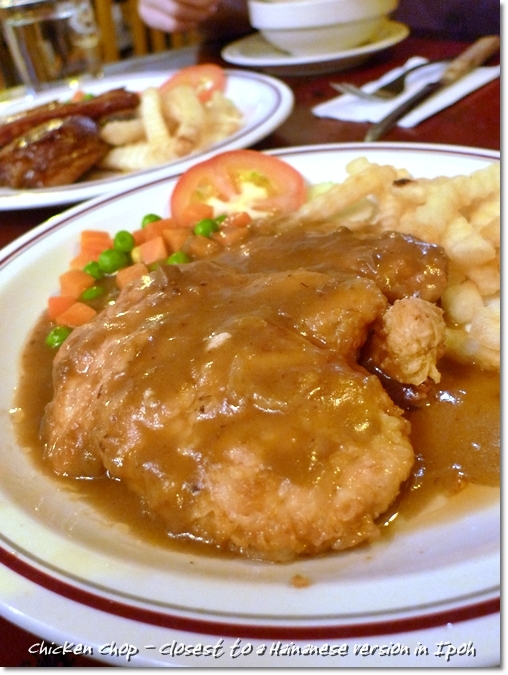 I have tried the chicken chop at YMCA before, when I was in secondary school. Though good of you to bring this up. YMCA serves mainly Chinese cuisine now, with their specialty of shark’s meat cooked in a variety of ways and a Futt Poot (yam ring with goodies in the centre). Wait a minute! In the 90’s?!! I should remember Pete’s if there was ever one there! Hmm ….. we used to go to the food court after the row of shops with Yohan and such, a Hollywood Food Centre or something. They had a good Zhu Chap Chuk (mixed pig’s offals porridge) back then. Miner’s Arms, Blue Window, HMS, The Scotch…..
And what is the name of that at the same row of Blue Window? Corner shop at the traffic light…. Rendezvous Cafe. I miss the food there and the ambience too. By the way the current chef for Secret Garden came from Rendezvous-Blue Window years ago. 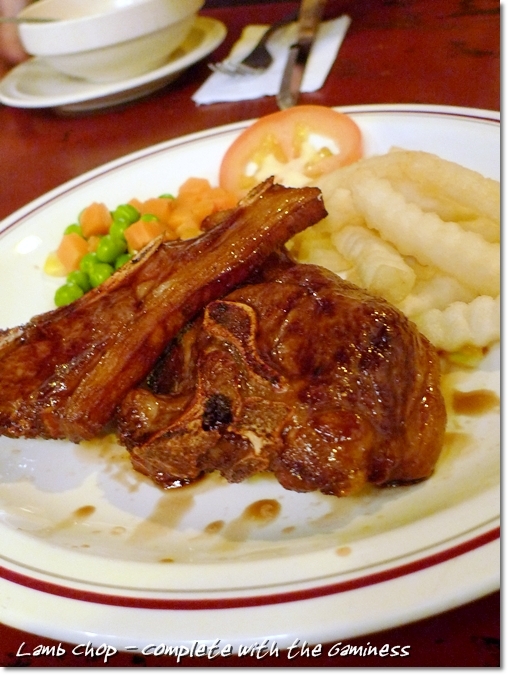 try Alan Western Food’s grilled lamb chop located at Restaurant Cha Yang, Ipoh Garden South – just behind Pizza Hut / Dance Centre – simply the best! Yeah, that stall actually has been around for some time. Still remember back in those days when I took up tuition classes at Wijaya, we always went there for the Western food, the pan mee, the CKT and the tong sui. I’ve been to Scotch since I was a small girl and although the service may not be up to par with what’s expected these days, the waitresses there are really friendly (like old friends). By the way, the menu hasn’t changed since the first time I went there and that was probably 20 years ago. My favs are definitely the lamb chop, steamed chicken drumstick (for this you’ll have to wait 30 mins but it’s worth it!!!) and of course the once in a blue moon fish and chips. Oh … yeah, heard about this place closing down and selling off … but no concrete proof. Any ideas?